I created the original TWT while working on a course project in autumn 2007. This course, LIS 537: Construction of Indexing Languages, directed students to construct a thesaurus for a chosen user group and domain. My group chose amateur astronomy, and created the Pacific Northwest Amateur Astronomy Thesaurus. The TWT was built as an aid to this thesaurus construction process, and an alternative to manual methods such as using index cards or spreadsheets to collect and organize terms. My group saw value in the tool (noted here: my final paper, Sonja's portfolio, and Tim's portfolio), and the instructor (Trent Hill) encouraged me to continue working on it so he might use it as a learning tool for future versions of the course. 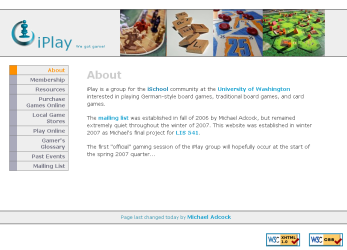 The tool was built out of a standard TiddlyWiki, through code customization and additions. 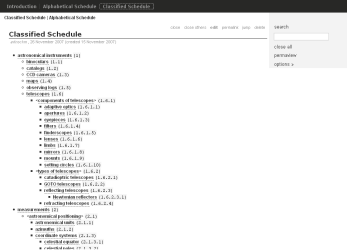 The TiddlyWiki technology has been described as a "reusable non-linear personal web notebook." Conceptually, it can be thought of as a collection of index cards ("tiddlers") with small chunks of content which are searchable, tagged, and linked to each other inside a single, self-contained web page. It's like a wiki because multiple people can edit it, but it's not page oriented - it is element oriented. I have attempted to use this project as a focal point and practical application for the methods and techniques I've learned in my coursework. In LIS 537 I created the TWT tool to reduce some of the repetitive, manual tasks that provided little educational value during the thesaurus construction process. In TC 518, my group conducted user research with members of the LIS 537 course taking place concurrently. I assisted one of the groups in that 537 course who chose to use the TWT tool, learned about additional usability issues, and implemented several requested features involving data import and notation. Finally, the independent study allowed me to address a number of usablity issues that had been identified, and to produce a new version of the tool. I hope that the TWT tool can provide some benefit for future students in the LIS 537 course, and lives beyond my own time in the Information School.